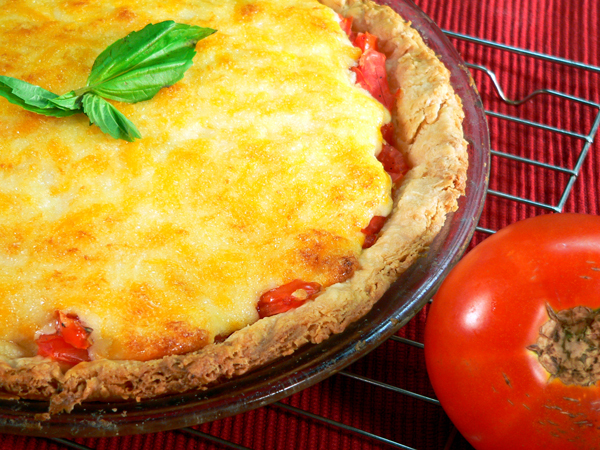 Fresh tomatoes in a pie crust somehow just doesn’t sound right does it? 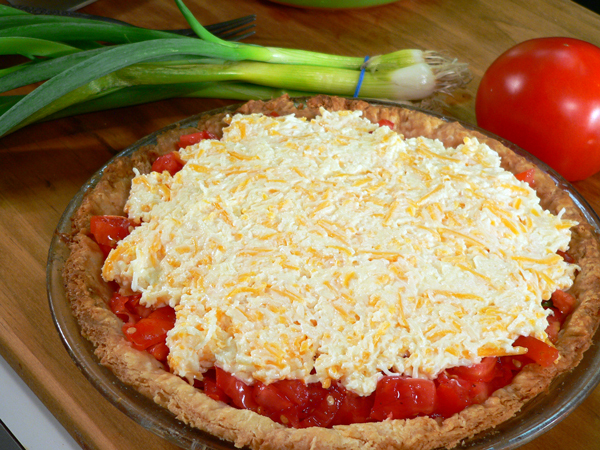 Well, if you’ve never tried Tomato Pie, you are in for one more delicious treat. 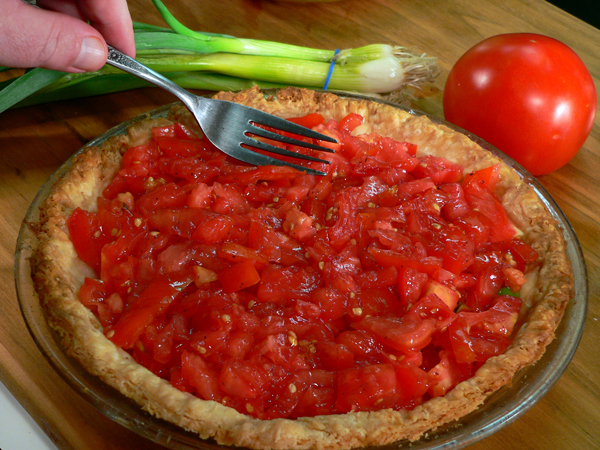 You can use a store bought crust but we’re going to show you how to make your very own homemade pie crust from scratch that just takes this fresh Tomato Pie up to a whole new level. Like me, I’m sure you’ll be wondering where this awesome dish has been all of your life. Try it. It’s quick, easy and absolutely delicious. You’ll find the step-by-step instructions below plus a printable recipe at the bottom. 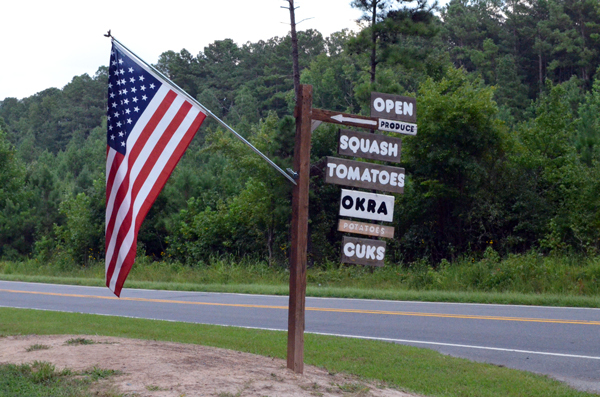 Road Trip: Not far from The Pier at Harris Lake, where I do all of my fishing, there’s a little roadside produce stand with some of the best tomatoes I’ve tasted since I was a kid. They grow them right by their house along with some other fresh produce and I find myself stopping by on a pretty regular basis right now. About every two months, one of my fishing buddies invites several of us over to his home for a Fish Fry. Billy and his wife Jan are wonderful people that have made me feel right at home over the past year or two that I’ve known them. I give Billy most all of the fish I catch, he takes them home and cleans them, then his wife Jan invites me over to enjoy them. How much better can it be? I love roadside produce stands and stop at just about every one that I see. I love this one! 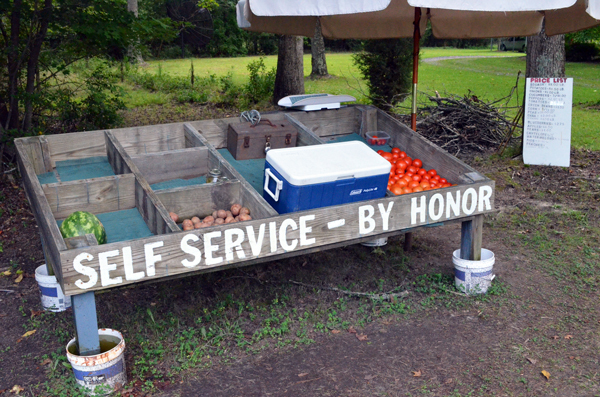 As the sign above says, it’s all self service and on the honor system. You pick out your produce, weigh it on the “baby scales” and then drop your money into the locked money box and go on your merry way. The sign leaning up against the tree has all of the prices and a large umbrella covers part of the stand. Cool huh? The selection was a bit low on this particular day. It was late in the evening when I stopped by and the recent days of 100 plus degree heat and lack of rain has caused some shortages of fresh items from the garden. Still, they had tomatoes and I knew I wanted to try them in my first ever Tomato Pie. On this day, they had one Watermelon left, some Red Skin Potatoes, Tomatoes, a couple of jars of canned Pickles….and the cooler had some fresh picked cucumbers, squash and a dozen eggs…all on a plastic soda bottle of water that had been frozen and placed inside to keep things cool. Several tomatoes and the fresh eggs went home with me but, I decided I’d wait on the watermelon. I was told these are a variety known as “Celebrity” Tomatoes. I looked it up and found they are a hybrid tomato but…whatever they are….they ARE delicious. I picked a couple from the right side, third row down, weighed them, dropped the money in the box and headed home. This is actually the very first Tomato Pie I’ve ever made. And, to the best of my memory, it’s the first Tomato Pie I’ve ever tasted. I don’t recall mama ever making one as I was growing up and don’t remember ever seeing them at the family reunions. Maybe my family just wasn’t hip enough to something with tomatoes in it being called a pie. Pie was suppose to be sweet and for dessert right? You can make this with a store bought, pre-baked pie crust but I knew I wanted to make my own from scratch if I was going to try one. I hope you’ll try it too and that just like me, you’ll kick yourself wondering where in the world this stuff has been all of your life. It’s just that good. What does it taste like? Well, I thought it might taste a little like pizza with all the cheese and tomatoes but, what about the pie crust? The pie crust part just wasn’t working with my taste buds in my mind about this. It’s just that Southern thing about pies being for dessert I guess. Not to fear though…it tasted wonderful. I do hope you’ll give it a try and I’ve got all the photos below to show you how to create your own. So, if you’re ready….Let’s Get Cooking! 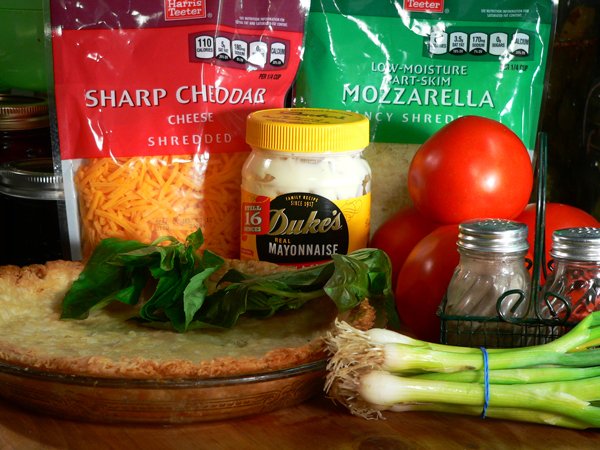 Tomato Pie Recipe: You’ll need these ingredients. I highly suggest that you follow my recipe for a Basic Pie Crust and make your own crust from scratch. It’s really easy and you will taste a big difference over those that you purchase at the grocery store. This pie is all about fresh ingredients and making the crust homemade just seemed like the natural thing to do. No, I didn’t make the cheese or the mayo but give me a little more time. I might try making the cheese but that Duke’s Mayonnaise, well, there’s no reason to even try and top that stuff. I’ve got a designated spot in the refrigerator that HAS to have Duke’s Mayo all the time. And no again, they aren’t paying me to say that. I just happen to really like the stuff. 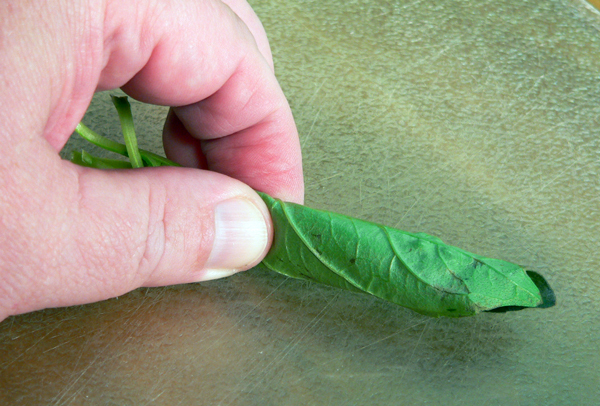 Begin the work on the pie by first taking several leaves of fresh Basil and stacking them all together like this. 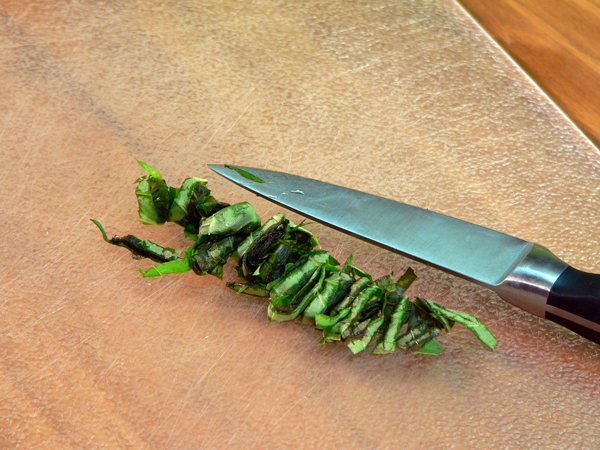 Roll the leaves up tightly. I was going to say roll them up like you were making a little cigar but I doubt that many of us have ever done that before. At least I haven’t. I opted to use some Spring Onions that I had on hand. I’m sure any variety of onion would work. Just slice and dice them up into small pieces. Slice up the tomatoes. 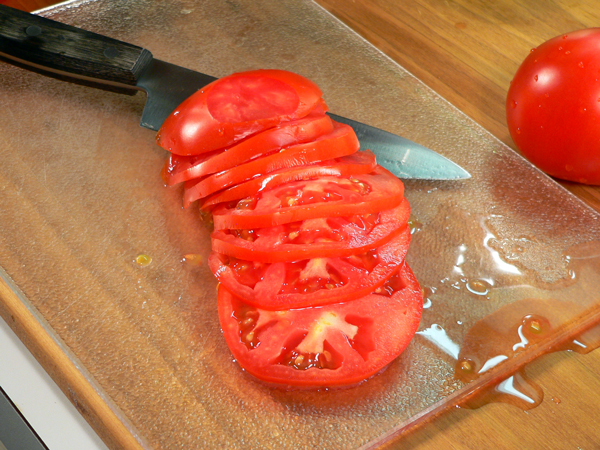 You can use the tomatoes in slices or…. ….you can dice and cube them up like I did. Whether you decide to just use the sliced tomatoes…or…the diced tomatoes, you’ll need to put them in a colander to drain. You don’t want a bunch of juice to make the pie all soggy. Place the colander in the sink or over a bowl to catch the juices that will soon be dripping away. Go ahead and sprinkle on some Black Pepper, using it according to your taste preference for pepper. 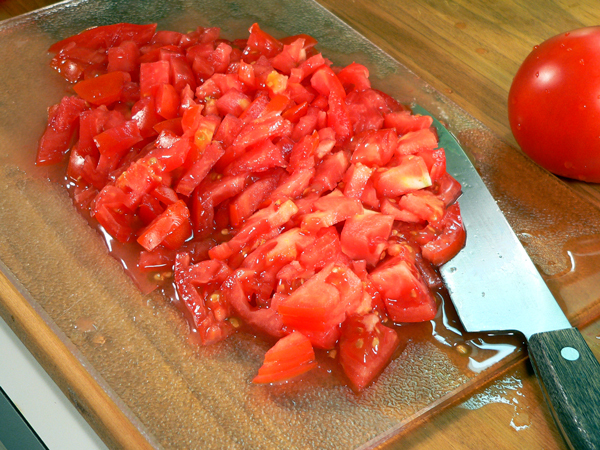 Then, sprinkle the tomatoes with Salt. 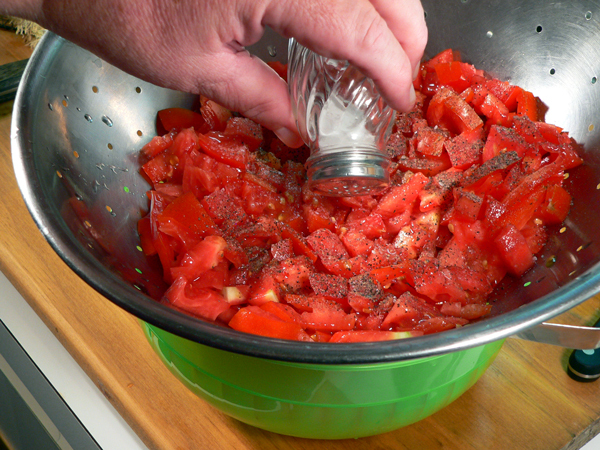 The salt will not only be helping the flavor, it will also help pull juice out of the tomatoes. It’s a needed part of the recipe…..getting the juice out that is. Now, set it aside for a few minutes and let it drain. 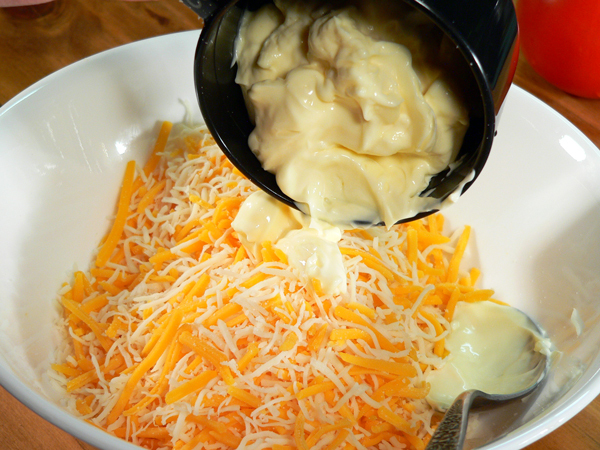 In a separate bowl, add the grated Cheddar Cheese. I’m using sharp cheddar. Add in some grated Mozzarella Cheese. Add in the Duke’s Mayonnaise. If by any chance you are an “alien” that doesn’t like mayo…don’t worry about this addition. You aren’t going to taste the mayo once the pie has been baked. Of course, for me, it’s hard to imagine that anyone doesn’t like mayo. Maybe we should talk. Grab a spoon and stir it all together. Stir it a little….stir it a lot…it doesn’t matter….it’s all going to melt together anyway. Just saying. 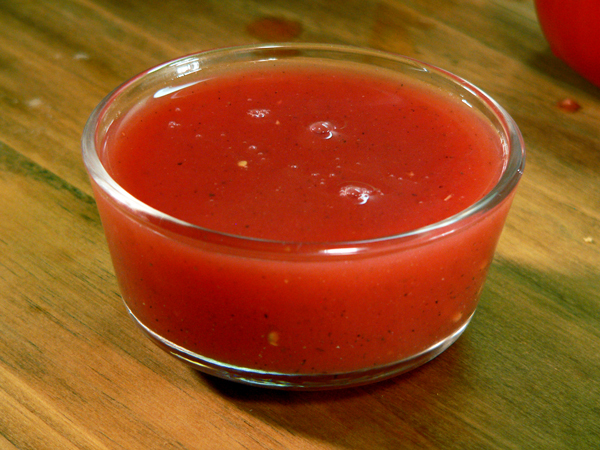 Stir the tomatoes around a bit to help the juices drain out better. Lets start assembling our pie. Using a cooled and pre-baked pie crust, toss in the onions and spread them around over the bottom. Add the chopped basil. OK…so I didn’t get a picture of me adding the chopped basil to the pie. There’s a really good reason for that. I mean…a really good reason. Like a really, really, really GOOD reason. They say confession is good for the soul right? Well the reason I don’t have the picture of me adding the basil to the recipe is…well…well….I accidentally somehow…just forgot…to ADD the basil to the recipe. That’s right…whew, I feel better now that I’ve owned up to that. I’m normal OK…I just somehow forgot to actually add the basil. 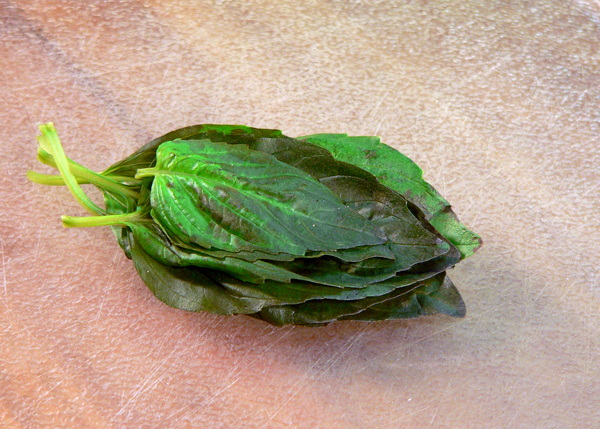 And of course, I purchased one of those little packs of fresh basil JUST for this recipe. On the other hand, I can confidently tell you that THIS recipe is STILL awesome, even WITHOUT adding Basil. Trust me on this one. Let’s move on. After you’ve drained as much juice from the tomatoes as possible, place them in the pie crust and spread them around evenly. Gently spread the cheese mixture over the top of the tomatoes. Doesn’t that look good already? Tomato Juice anyone? Look how much juice came out of these tomatoes. It’s even salted and peppered. Bake for about 30 minutes at 350º or, until the cheese has slightly browned. Watch it carefully and don’t let it burn. Our Tomato Pie will be best served warm. I found however that trying to cut it while warm made it a bit difficult. It was really delicious but…a little messy for presentation. Instead, let the pie cool completely and then place it in the refrigerator for a couple of hours. It will setup nicely after this time and it will be much easier to slice…and prettier. Place a slice on a plate or serving dish and then pop it in the microwave for about 30 seconds. You could also slice it and slip the dishes back in the oven for a few minutes to warm back up. Just don’t heat it too much or it will turn all soft and runny on you again. I’ve also placed a couple of slices in the freezer. After letting them thaw completely, just a quick trip in the microwave and you can enjoy a slice of Tomato Pie any old time you want one. 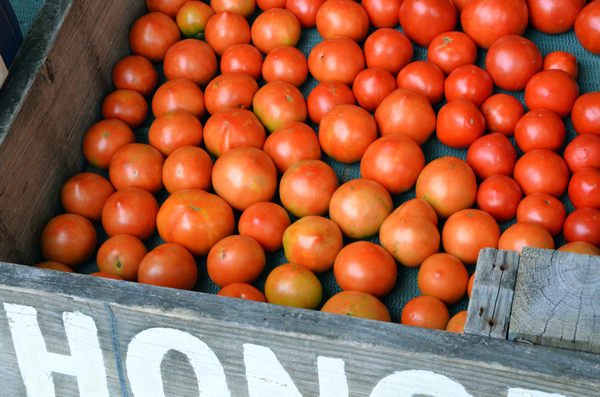 2 – 3 fresh Tomatoes, sliced or cubed. 8 fresh Basil leaves, finely chopped. 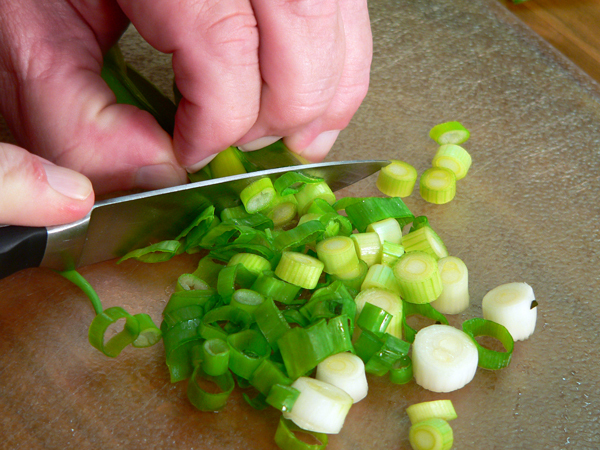 1/2 cup Spring Onion, or other onion, chopped. 1 Pre-Baked Pie Crust, 9 inch. 1 cup of grated Cheddar Cheese. 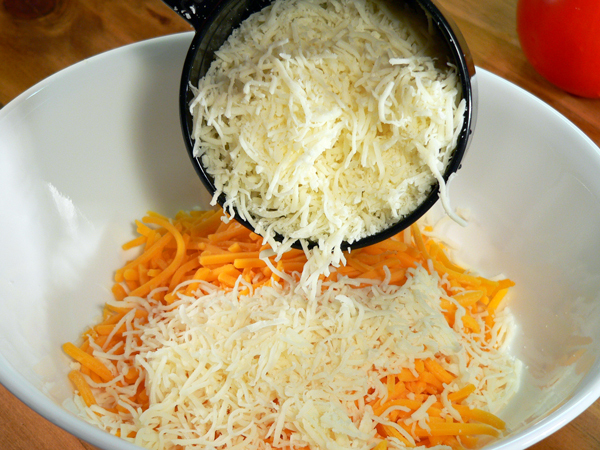 1 cup of grated Mozzarella Cheese. 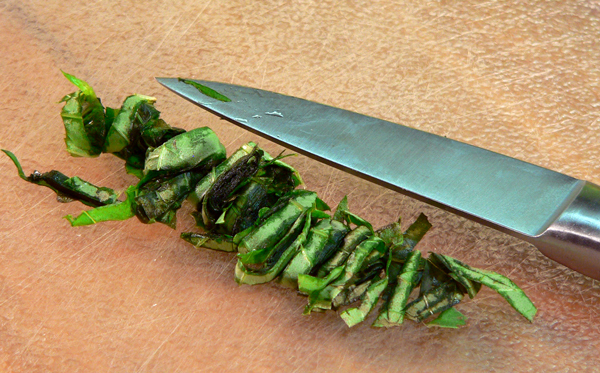 Slice and chop the Basil, set aside. Slice and chop the Onion, set aside. Slice and cube the Tomatoes, place in colander to drain. 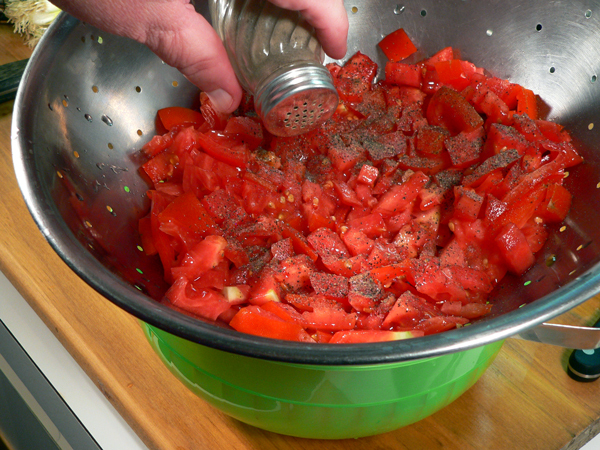 Sprinkle the Tomatoes with Black Pepper. Sprinkle on the Salt, stir and let continue to drain. 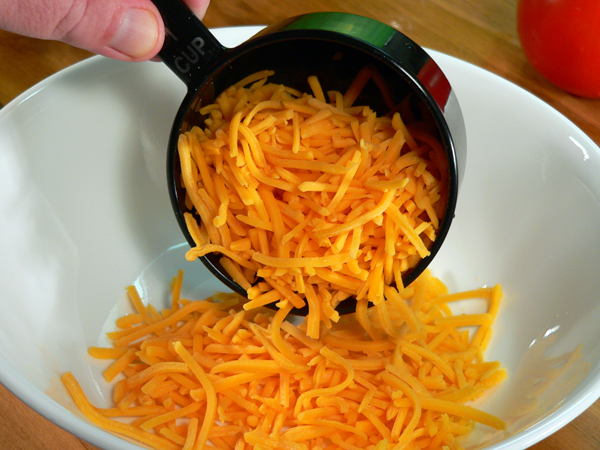 In a separate mixing bowl, add the Cheddar Cheese. Add the grated Mozzarella Cheese. Add the Mayonnaise, stir until combined, set aside. 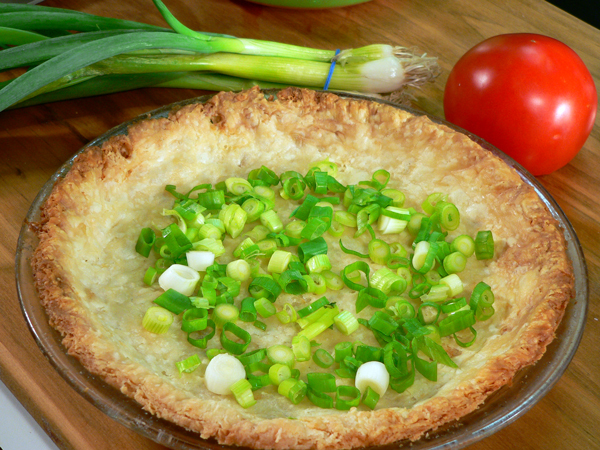 To assemble the Pie, place chopped onions in bottom of crust. Sprinkle with the chopped Basil. Add the drained Tomatoes, spread around evenly in crust. Top with the Cheese mixture, spread almost to edges of pie crust. Bake at 350º for about 30 minutes or until lightly browned. I found the pie was easier to cut and serve by letting it cool completely first. Refrigerate it for a couple of hours, then remove and slice. Place individual slices on a serving dish and microwave each slice about 30 seconds or just until warm. If warming in the oven, don’t let it get too warm before serving. Your Comments: Have you ever tried Tomato Pie? How do you like it? Can you see the possibilities available for changes and additions to our recipe. We’d love to hear from you. If you’ve read this far, please take a moment or two and leave us a comment on your visit to Taste of Southern. I’m always delighted to have you stop by any time. The only way we know you’ve visited our site is when you leave us a comment. It will only take a minute or two so I hope you’ll do just that. All comments are moderated. That means, I personally read each and every one before it’s approved for posting on Taste of Southern. I will also respond to as many comments as possible so check back soon for my reply. As always, I hope you’ll help us spread the word about our site and we look forward to you stopping by again soon. Can you replace the mayo with ricotta and an beaten egg? Pie looks great. Been wanting a good pie shell recipe too. Please e-mail me. I made the Tomato Pie yesterday, I followed the recipe except I had no green onions and I did add garlic powder. I made half the recipe as it is only the two of us and used a very small pie tin. Now that I know we like it, next time I will make the whole recipe. We thought it was very tasty. I must confess I used Pillsbury ready made pie crust. I am sure your home made is better. Mine, not so much. My husband is from Tennessee, but his Mom never made this back in the 50’s, so it was a new dish for us. After reading some comments I might try some of the suggestions for additional ingredients, but the basic pie is a tomato lover’s dream dish. Thanks for the recipe. We love reading your newsletters. Thank you for sharing your recipes and memories with us, I ALWAYS enjoy your newsletter. Have a good week and God bless. I always like reading your letters. The pictures of your cooking always make me hungry, but I still appreciate your doing this! I made this pie last summer using your pie crust recipe also, it was great. I’m glad that you posted it again, I had forgotten about this and how delicious it was. Jenny G. says she added bacon to it, that makes it sound even more great. I have all the ingredients on hand and need to do this one today. My husband appreciates it when I make a special meal, and this one qualifies as one. I use Vidalia onions in it. Have a great week, looking forward to your next newsletter and recipe. Hi Steve, This pie is really good…can’t get enough! Anyway, I partially cook bacon and add to the other ingredients except for topping. I also do not pre-bake the crust. Draining the tomatoes well is the secret in keeping the crust from becoming soggy. I prefer green onions and use the tops as well. 15 minutes before I take from oven I add the cheese/mayo topping. Turns out fantastic. Thanks and blessings to you. Found this wonderful recipe & would like to make it tomorrow. I have a frozen (store bought) Marie Callender’s pie crust in the freezer I would like to use. Should I bake the pie crust first? Hi Steve! I’m a bit late checking in here to see this delicious sounding recipe…we will definitely have to make it! It sounds just like something Hannah may have tried another year, but I’ll make sure we follow your recipe exactly…well, except for putting in the basil. I think basil just makes a recipe! Thanks, Steve! Hope your summer is going well and that you’ll have a good Labor Day Weekend. Hi Steve, My daughter gave me a version of this recipe several years ago, but we could never figure out how to keep the crust from getting soggy. Thanks for the hints! BTW, we use minced garlic instead of onion, and always a mix of cheddar and mozzarella. A little extra mozzarella seems to improve the texture. I suppose instead of hanbanera cheese you could add a few drops of tobassco, I’m sure my husband would really love it that way. This recipe is always a summer favorite. There is a restaurant in Lititz, PA that is called Tomato Pie. I wish I lived closer so that I could eat there every day! But I found your website and I have followed your recipe. Thank you so very much for sharing. Debbie, I live in PA so I thought I’d check out that restaurant. They serve the tomato pie for breakfast! What a great idea! Tomato Pie Cafe also has a location in Harrisburg, PA. A good friend took me there for lunch…liked it so much I brought my husband next time and he liked it as much as me! Debbie, I came here looking for a recipe that tasted like Tomato Pie Cafe’s. I just had my first slice from there last month, and now I am a convert. Is this recipe pretty similar? Would it be possible to freeze the whole pie? If so, would it need to be baked first or can it just be popped in the freezer after being prepared? Thanks! Hi Gretchen, Thank you for your question. I’ve never frozen a Tomato Pie, so can’t say what the results would be either way for doing so. I do think that I would bake it first, let it cool, then freeze it if I were going to try to do so. I hope you’ll let me know how it turns out should you freeze one. I went to visit my daughter in Wilmington, NC and we stopped at a little restaurant…just a little hole in the wall and we both ordered tomato pie. It was to die for. I wanted to recreate the recipe at home and surfed the internet and I found your recipe and tried it. Thank you. It took me back to the wonderful memories I had visiting with my daughter and finding the delightful restaurant. The only thing I changed was I added Oregano to it. I have made this recipe all summer long with my home grown tomatoes and next time I make it I will add the Basil and Oregano….yum. Hummm wonder how it would taste with Feta Cheese? 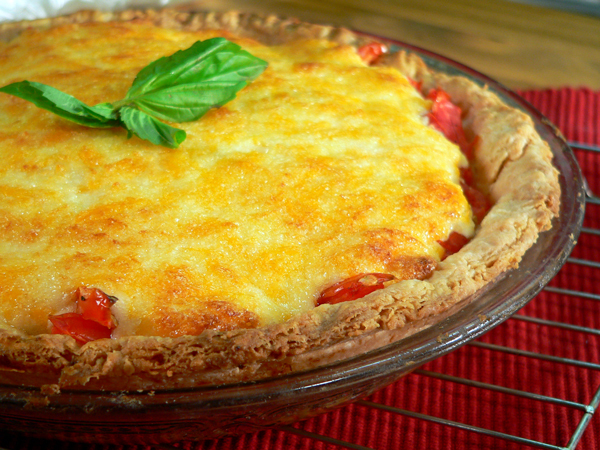 Would have to call it Mediterranean Tomato Pie instead of Southern Tomato Pie. I’ve been making tomato pie for years but have never made my own crust. Wow! What a difference! 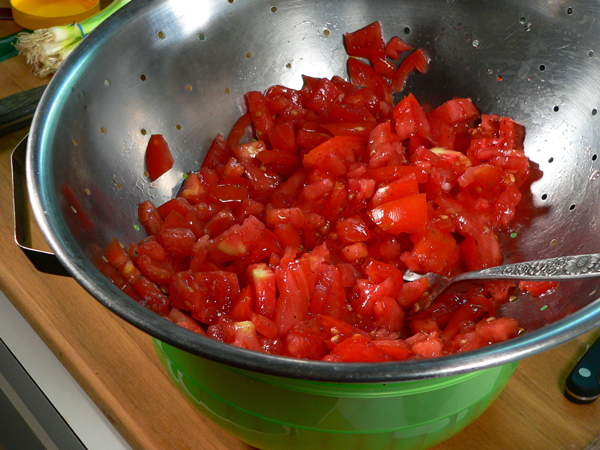 My recipe is very much like yours, but the other improvement I picked up from you was dicing the tomatoes. 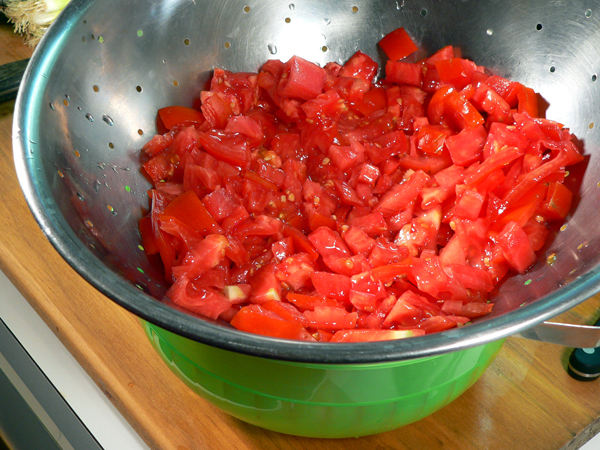 You can fit more tomatoes in the pie crust diced than sliced. Thanks for the great and entertaining recipe. Oh by the way, to me this is Southern Pizza! 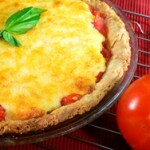 Just a note to say how much we love your Tomato Pie recipe!! 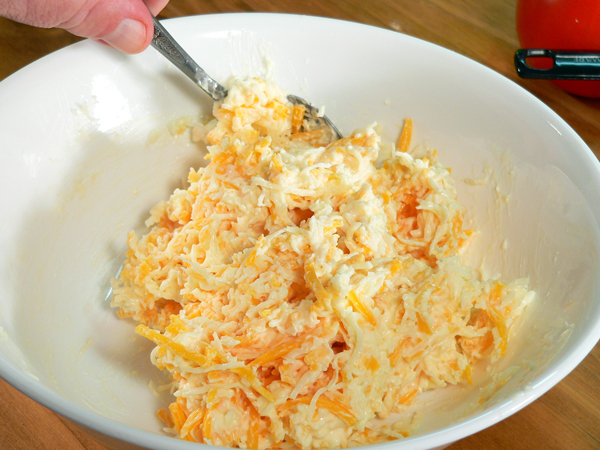 My family enjoys an extra “kick”, so I added 1/2 cup of Cabot’s Habanero cheese (grated) to the cheddar and mozzarella mixture….very, very nice!! Tonight I am taking 3 pies to a family dinner—including one gluten free pie— so everyone will be thanking you once again! 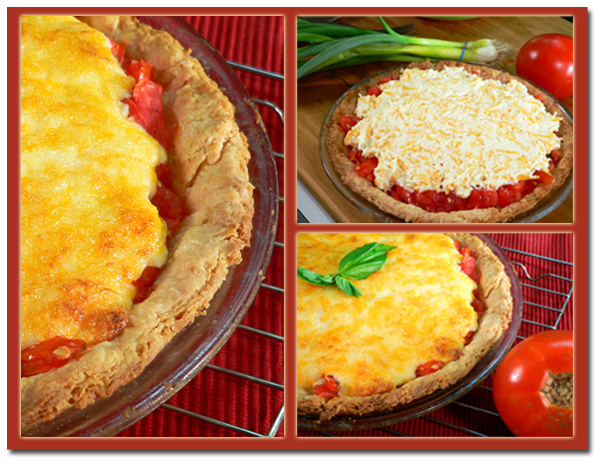 My garden is overflowing with tomatoes and I should have just enough fresh basil to make this tonight. I can hardly wait! I’ve never tried tomato pie, but my taste buds are READY!! This recipe is really great. I have a recipe for tomato pie that i’ve been using for several years, almost identical to yours but only used mozzarella, no cheddar. The cheddar just kicked it up a notch!! Really really good. I really enjoy this site and your easy to follow recipes! Thanks so much! Hi Carrie, Thank you so much for your comments. I’m very happy to learn that you tried the recipe with the cheddar and liked it. I’ll have to try your version with the Mozzarella next time. (Maybe even toss in some Pepperoni?) How would that be? I bet it would be good though. Hello! I just made your tomato pie for last night’s dinner. I had never had it before despite being born/reared in the South. My husband commented that it was ‘make for company’ good. My grocery was out of fresh basil, so I left it out since you said it is good with or without. So glad I found your easy, delicious recipe. I love this recipe. I looked over many others and this was the best. I love the instructions and photos. I will be saving to my files.